Are things getting any better for Sam? Has the Better Things TV show been cancelled or renewed for a third season on FX? The television vulture is watching all the latest cancellation and renewal news, so this page is the place to track the status of Better Things, season three. Bookmark it, or subscribe for the latest updates. Remember, the television vulture is watching your shows. Are you? 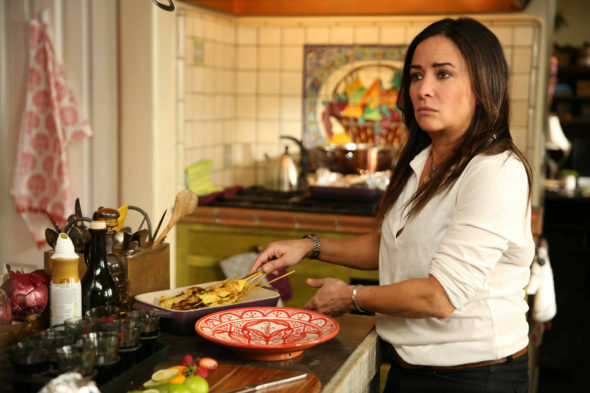 Airing on the FX cable channel, Better Things stars Pamela Adlon, Mikey Madison, Hannah Alligood, Olivia Edward, Celia Imrie, Rebecca Metz, and Alysia Reiner. Sam (Adlon) is a divorced woman without a filter, who’s just trying to raise her three daughters — teenager Max (Madison), eccentric Frankie (Alligood) and spicey Duke (Edward). She also has to keep an eye out on her mother, Phil (Imrie). Sam fills the roles of dad, referee, and the cops, as well. If only she could find a little time to live her own life, too. The second season of Better Things averaged a 0.15 rating in the 18-49 demographic and 459,000 viewers. Compared to season one, that’s down by 24% in the demo and down by 3% in viewership. Find out how Better Things stacks up against the other FX TV shows. On October 19, 2017, Better Things was renewed for a third season which will debut February 28, 2019. Stay tuned for further updates. Although it premiered with worse numbers than its first season, I suspect that FX will renew Better Things for season three. I’m interested in seeing if the cable network will be vindicated in its decision to give this comedy drama from Adlon and Louis C.K. an early second season renewal. I’ll keep an eye on the Nielsens and update this page from time to time. Subscribe for free updates on any Better Things cancellation or renewal news. 10/19 update: Better Things has been renewed for a third season on FX. Details here. Find more Better Things TV series news or other FX TV show news. What do you think? Are you happy FX renewed its Better Things TV show for a third season? How would you feel if they had cancelled this TV series, instead? More about: Better Things, Better Things: canceled or renewed?, Better Things: ratings, FX TV shows: canceled or renewed? Mayans MC: Is the FX TV Series Cancelled or Renewed for Season Two? Love the show. It feels real. I came late to this show. I love it. Just subscribed to Hulu so that i could watch season 1. Smart, touching, funny. My favorite tv night. Love Better Things! Please FX, don’t cancel! !